Yesterday we made our very first Sock Puppet!! Her name is Snowman Sockpuppet. 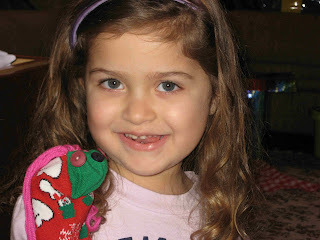 We used an old sock of mine that she grabbed from my drawer, its red with white snowmen on it (hence the name). Muffin helped me pick out the buttons for the eyes/nose and she insisted she wanted pink hair on it. Thankfully I had some pink cheap yarn we could use. And then mommy got to work sewing. Of course after I finished it she got upset because I said we couldn't use the pink yarn to make the sock puppet completely pink. By bedtime, though, she told me that she now liked the sock. Here's a link to a little video of Muffin telling the story of the sock puppet being made by Mami.